If you use essential oils, you probably know just how amazing they can be for health and wellness. These aromatic extracts offer lots of benefits for home, your meditative space, and also your place of work. Essential oils can help reduce stress and anxiety, kill harmful germs, and increase your productivity. They can help boost your mood, help you concentrate, and make the work environment a little more inviting. Here are 7 easy ways that you can use use essential oils at work. There is no shortage of germs circulating around the office. Whether its your desk, keyboard, or even your phone, chances are, there are some unwanted illness causing bacteria or viruses hiding around. Regularly wipe down your workspace with essential oil based cleansers. Simply add a few drops of the oil to a damp cloth or towel and wipe down the surfaces (careful to avoid electronic ports and display screens). Whether in public restrooms, shaking hands in a meeting, or taking public transit in your daily commute, you are coming into contact with many different bacteria and viruses. As we know, proper hand washing and hygiene is key to avoiding illnesses. When we are on the go, such as on a public train or in a taxi, washing our hands with soap and water simply isn’t always feasible. Hand sanitizers are a simple way that people supplement their hand washing regiment. While hand sanitizers do not replace hand washing, they can be effective at eliminating some potentially infectious microbes from your hands. If you aren’t keen on using alcohol based hand sanitizers all the time, consider using essential oils. Oils such as cinnamon have been found effective at inhibiting common sources of bacterial causing illness including those that were resistant to antibiotics. If your office is scent friendly, consider using a small oil diffuser. Use one that uses natural wooden reeds or an electric one that has an automatic shut off. (Avoid candle based diffusers for obvious fire risk). If a diffuser is simply out of the question, opt instead for a small spray bottle. Simply fill the bottle with fresh water and several drops of your favourite oil and spray a light mist around your work space. Use the spray to clear your space of airborne viruses and bacteria, as an air freshener, or both! It can be challenging to focus in the office, particularly in open concept work environments. With all of the background noises, disruptions and constant distractions, getting work done can be quite a challenge. Scientific studies have found that peppermint oil for for example is particularly effective at improving focus and promoting concentration. In addition, it also helps to increase alertness increase alertness. You can use a spray bottle or simply inhale the smell of the peppermint straight out of the bottle. For a lasting aroma, add a few drops to a cloth and keep it out on your desk. There’s no doubt that workplaces can be stressful environments. From deadlines, to budgets, to personality clashes, there’s no shortage of opportunities to feel stress creeping in. Oils such as lavender and salvia have been found to help reduce workplace stress. Orange oil has also been found to be effective at reducing anxiety as well as improving mood. Other good oil options for release from stress and anxiety include: lime, rose, grapefruit, bergamot, and sandalwood. Essential oils can be used effectively in many minor first aid treatments. Tea tree oil in particular is known for its anti-microbial properties and lavender for being an antiseptic. Tea tree and lavender essential oils have been used for centuries to clean cuts, scrapes, and burns in order to prevent infection. They can easily be used at the office to clean minor injuries such as cuts and scratches. If you’re struggling to remember things at work, essential oils might be beneficial for you. In clinical studies, researchers have found that inhaling rosemary essential oil improves memory, particularly number and image retention. Both spearmint and rosemary oils have also been found to offer benefit for learning in addition to memory. In conclusion, essential oils offer a wide assortment of uses in the office environment. 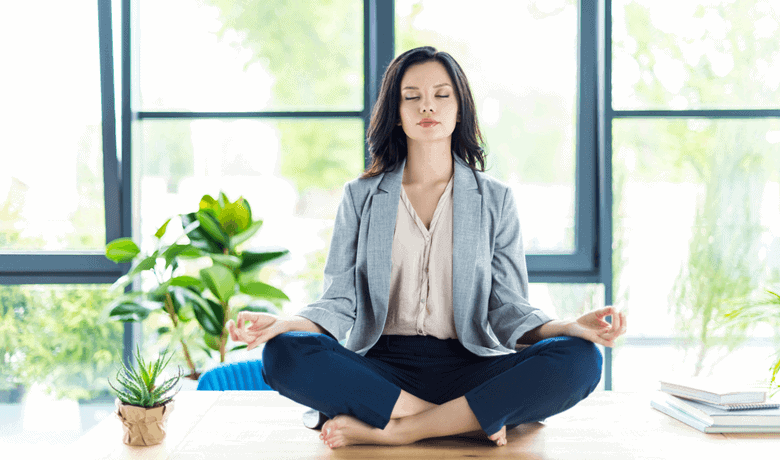 Whether to keep your work environment clean, protect you from getting sick, or reduce stress and anxiety, these natural products can offer immense benefits in your workspace. Try for yourself and see how a few drops of essential oils at work can make your day that much more enjoyable!